*First Time Skier Guide* Questions Answered! Plus a Winter Ski Giveaway! This post was created as part of the Trekaroo Influencer Network on behalf of Deer Valley Ski Resort. As always my opinions are my own. I have lived in Utah all my life and somehow I have never been skiing! I know it’s crazy. We have some fantastic ski resorts, like the Deer Valley Resort, that have some of the best ski slopes around. We are planning on going out of the country this coming spring, so I really want to cross skiing off my bucket list before we leave. Unfortunately it can be overwhelming trying new things and skiing is no exception. I like to do research before trying anything for the first time and I always have a ton of questions I need answered before heading off on our next adventure. I got the chance to ask Kurt Hammel, the assistant manager for Children’s Programs at Deer Valley Resort, some of my first time skier questions and they have eased my fears with some excellent answers. But first, a little background info. Deer Valley Resort has revolutionized the ski industry by providing the first-class service one would receive at a five-star hotel. The resort offers 21 chairlifts, 100 ski runs, six bowls, 12 restaurants, 300 annual inches of powder, three elegant day lodges, 2,026 acres of alpine skiing, hundreds of luxury accommodations and a renowned Ski School and Children’s Center. Q1: For first time skiers, what should they expect from their first ski lesson? Can you walk me through what a typical lesson looks like? Patience is key for first time lessons. With adults it can typically take an hour to get them comfortable sliding around and stopping. With kids it may take even longer for them to grasp the concept of stopping and that is one of the most important steps. A typical first time will involve learning about the parts of the ski (how to properly fit your boots, how to get in/out of bindings), starting to slide on one ski, then two skis on flat terrain. We will then focus on a wedge (or “pizza” stance) and gliding and stopping. You can learn these skills on a very gentle slope. After learning to control your speed by using the wedge, we will move on to direction changes. Most beginner lessons will focus on having students learn how to glide, stop and turn. 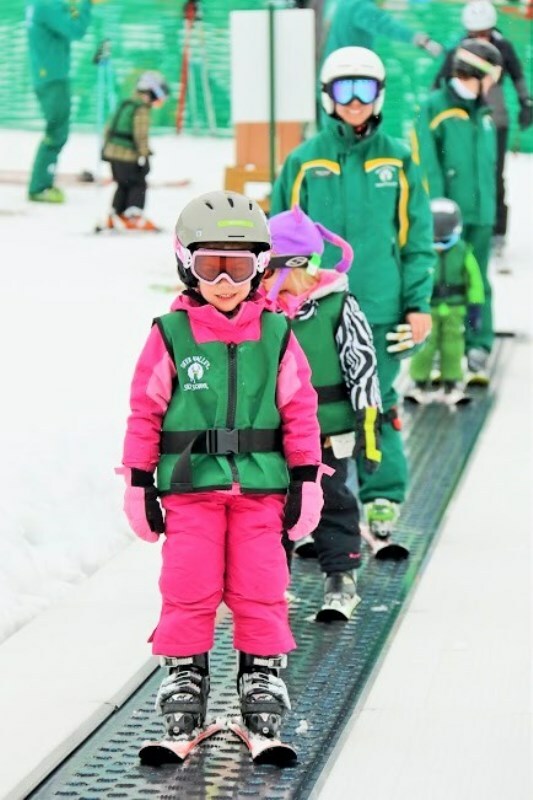 Q2: What is involved in the ski lessons for kids? How are they different than adult lessons? Kids lessons focus on all of the same skills but it is so important to make the experience fun for them. Younger kids learn through play and will pick up the actual skills simply by following instructors. You can use simple games such as “red light, green light” or “Simon says” to keep them engaged. Adults often have a more practical, results driven approach. Deer Valley’s motto is Safety, Fun and Learning. There is nothing harder to teach than a child who is not having fun! Q3: At what age can kids start to first learn to ski? We start taking kids in lessons at 3 years old. We tailor all of our kids group lessons to both the physical and emotional needs of different ages. Q4: Do Deer Valley’s instructors or the resort provide anything that other ski resorts might not? In other words, why Deer Valley? 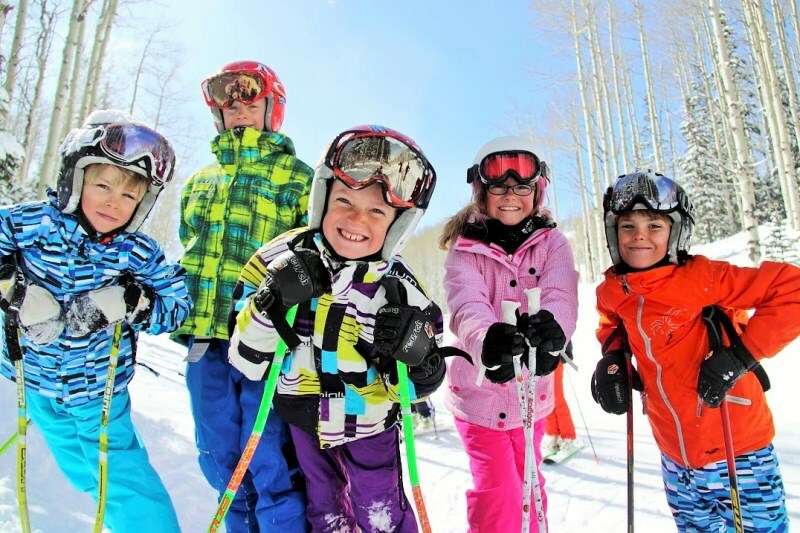 Deer Valley has kids group lessons that are divided by age to provide the best quality for all. We have small ratios and stick to them as an everyday product not a premium. Children are broken into different age groups with the following ratios: Fawn 1:1, Bambi 2:1, Reindeer 4:1, Adventure 6:1. All programs include lift ticket and lunch. Q5: Do you have someone that can help with choosing the right equipment or should that be done at a store or online? We have an experienced instructor and indoor staff as well as our own rental shop on-site to help with any equipment questions. Hand-me-downs are great, but having proper fitting equipment for kids is key! You can always check with your local ski shop as well. Q6: What kind of clothing should be worn before skiing? Is there any clothing that would be different for children? Layers, Layers, Layers! Weather in the mountains can often change so it is best to be prepared for a range of temperatures. Children tend to be warmer or colder faster than adults, so being able to shed or add a layer during the lesson is helpful. Always supply eye protection-- we strongly suggest ski goggles but sunglasses work too. Side note about socks: It’s important to not have extra thick or multiple socks on. It can lead to a bunched up painful mess in your boots! Q7: Is a lift pass included with the lessons? If not, are there beginner lift tickets to buy if we won’t ski the whole mountain? 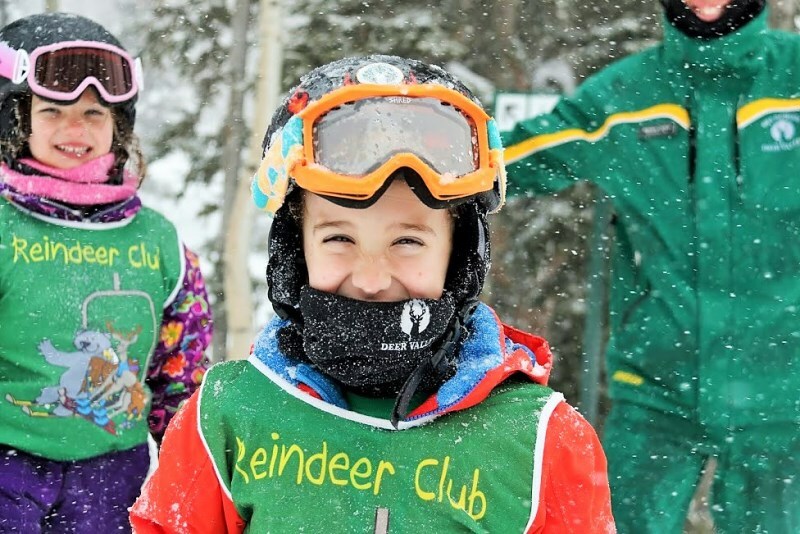 Deer Valley’s Kids group lessons do include a lift ticket but private lessons do not. We have a beginner lift ticket that is $35/day (all ages) and gives access to our beginner area that includes Burns and Snowflake chairlifts, our 3 Snow Park area Surface (conveyor) lifts, Silver Lake Express chairlift and the surface (conveyor) lift at Silver Lake. Q8: What are some safety tips that should be known before hitting the mountain? Be prepared, elevation changes can often be hard on children and adults. Rest up for the first day and drink plenty of water. It is important to pace yourself while skiing. Being anxious or stressed out is an easy way for injuries to happen. Relax, this is supposed to be fun after all! I feel so much better having these answers. For those with kids, I think this is incredibly helpful to know what to expect when you take your kids to the mountain for the first time. I love that Deer Valley separates the kids into age groups to create a better learning experience. My kids learn best when they are having fun and Deer Valley applies that same approach. Even though it’s something new and it can take practice it can still be super fun. When our family heads up to Deer Valley I will have to keep in mind to stay relaxed as Deer Valley pointed out; “Being anxious or stressed out is an easy way for injuries to happen”. This is true across any sport or any new adventure. 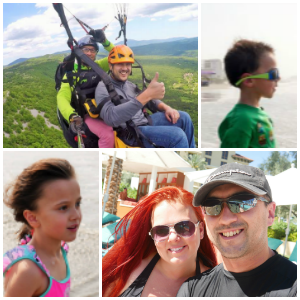 I think as moms we can get a little stressed out watching our kids trying new things and even feel a little stressed trying out new adventures ourselves. When I think about the clothing I will need for skiing I just think tons of layers. It’s good to know that there is such a thing as too many layers. I would be one of those people putting on several pairs of socks only to have my feet in pain by the end of the day. Make sure you can add or shed layers if needed. Our family is super excited to get some skiing in this winter and I know we will be in good hands at Deer Valley Ski Resort. If you are looking to hit the slopes this winter be sure to check out Deer Valley! Many thanks to Kurt Hammel, the assistant manager for Children’s Programs at Deer Valley Resort. Previous to this position Kurt worked as a Ski School supervisor, summer camp supervisor, ski instructor and in trail crew. Kurt learned to ski when he was 8 years old and has been passionate about the sport ever since. He and his wife are new parents to their daughter and can’t wait to get her on skis. When not on the mountain, Kurt enjoys golfing and hiking. 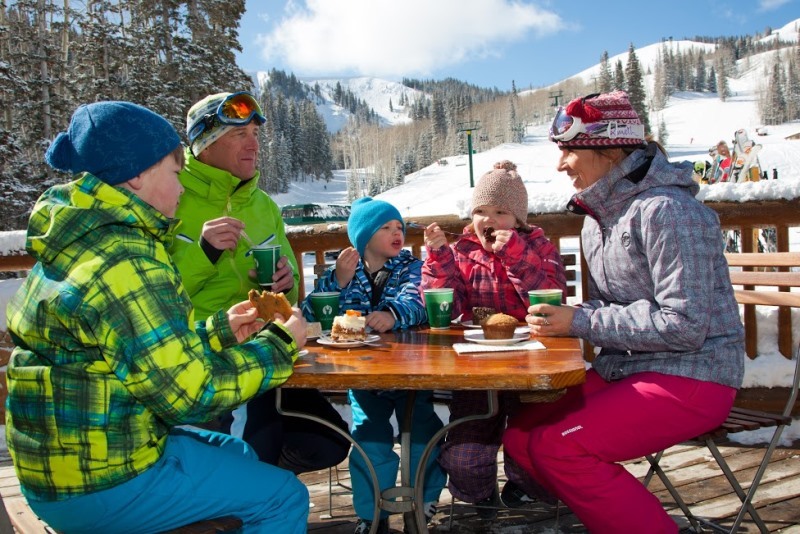 Family Value Package: Kids ski FREE and save 20% on lodging, lift tickets and ski rentals. With family-friendly amenities including an outdoor pool and hot tub, free hot breakfast buffet, a complimentary in-town shuttle and an onsite restaurant and rental shop, all within close proximity to Snow Park Lodge and ski school, the Lodges at Deer Valley and Silver Baron Lodge are the perfect choices for families vacationing at Deer Valley Resort. Package is valid December 5 – 17, 2015; January 4 – February 10; and March 28 – April 10, 2016. Receive up to two complimentary lift tickets for children 12 and under per day as well as two Deer Valley children’s ski rental discount vouchers. The purchase of four adult lift tickets is also required. Minimum night stay is required and varies by property. This winter get out and have a skiing adventure with your family! Love what you just learned about skiing? Grab more first-time skier questions and answers over on Trekaroo’s #ReadytoSki, and enter to win one heck of a winter ski giveaway. Idaho Prize: 4 lift tickets to Bogus Basin Mountain Resort and 2-night stay at Riverside Boise.